Charlene Wang and newly recruited migrant worker Zhang Min hope to make a difference to the lives of women in rural China. Despite the country's economic development and improved living standards, China has a high suicide rate for rural women. 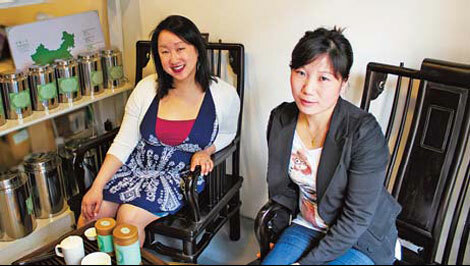 "It's usually linked more to a lack of economic independence and opportunity than mental illness," said American-born Chinese entrepreneur Charlene Wang founder of Tranquil Tuesdays, a tea and teaware business that aims to offer underprivileged Chinese women jobs, along with the proper training and support, to help them realize their true potential. "I really wanted to set up a social enterprise and I was attracted to the idea of having a sustainable organization that is self-funded," explained Wang. For Wang, tea was the obvious means to achieve this. "I've really loved tea ever since I was young. I am fanatical about it. It's so essentially Chinese." The organization's office, which also doubles as a chic showroom and shop, is located in an unassuming Beijing hutong. It is decorated with antique furniture, stacks of tea canisters, teacups and teapots. 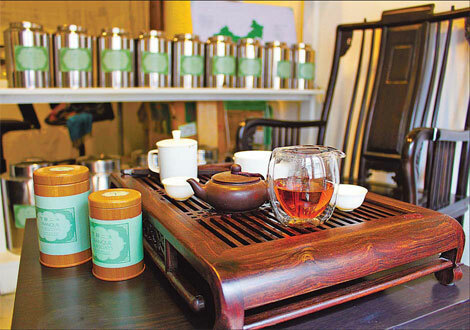 Here customers can sample and buy high-quality teas personally sourced by Wang from all over China and purchase uniquely designed teaware by artists from the Chinese pottery capital of Jingdezhen. The proceeds are reinvested into employing and training women in rural China and helping them achieve their life goals. Initially brought to Beijing via her job with the American Foreign Service, Wang spent some time working with victims of people trafficking and wanted to set up an enterprise to help address some of the issues the rescued women faced. Wang thought if these women could be offered a real job with responsibilities and taught transferable skills, it would offer them new opportunities and a new life. "I thought it was maybe one of the best things in the world to offer a woman in that situation," she said. "So that's what I want to do: provide that training and a job." Wang aims to eventually employ women all along the business chain, from the tea suppliers to the sales staff to general manager. "I think the most important thing is the right attitude," said Wang when explaining what she looks for in potential employees. "I think the only things you can't teach someone are a good work attitude and initiative - the things that are more intrinsic." Employment and skills are not the only things Tranquil Tuesdays offers its employees. The enterprise is a company "made by women for women" and aims to be the ideal company for women to work in. Wang doesn't believe childcare should have to impact on a woman's career and offers employees flexible working hours and school fees support. Zhang Min, who spent the last three years in Beijing working as an ayi, is quickly adapting to working in the office, studying English and learning skills that she said will benefit her in the future. Zhang has been able to bring her son to live with her and her husband in Beijing having spent three years apart. "My biggest dream was for us to all live together in Beijing and now we can," said Zhang. "I have many more dreams, I will work hard to achieve them. I hope that Tranquil Tuesdays becomes bigger and stronger, so that we can help many more people."